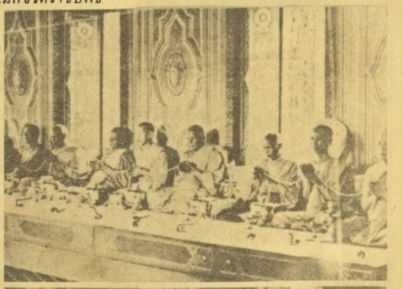 Pra Somdej Waek Man Pim Chedi Norn Wat Lakorn Tam Nuea Pong Wat Rakang Gao Luan Indojin Ceremony 2484 BE - Luang Por Supoj Wat Sutat. The Pra Somdej Chedi Norn is a Pim that represents the 'sleeping Chedi Stupas' at Wat Lakorn Tam. The temple of Wat Lakoirn Tam was close to Wat Rakang Kositaram, and it was the Great Somdej Pra Puttajarn (Dto) Prohmrangsri of Wat Rakang Kositaram who financed and installed two sleeping Chedi Stupas at the temple. Three different Masters of the Somdej Pra Puttajarn (Dto) Prohmrangsri lineage and makers of the Pra Somdej within the Dtamra of Somdej Pra Puttajarn (Dto) Prohmrangsri, have made this model of amulet, namely Luang Phu Nak, Luang Phu Hin, and Luang Por Supoj. Each Master pressed and blessed his own versions. 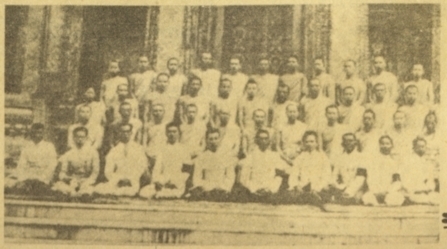 Luang Por Supoj was one of the Important Gaeji Ajarn Monks of his Era, and a colleague of the other Great Masters of the Royal Bangkokian Temples of Wat Sutat, Wat Rakang Kositaram Wat Bang Khun Prohm. He was a close friend and colleague in amulet making with Sangkarach Pae, Luang Phu Nak, and Pra Kroo Lamoon. For his amulets, he was able to receive a generous portion of Muan Sarn Sacred Powders and broken old Pra Somdej Wat Rakang Kositaram of the great Somdej Pra Puttajarn (Dto) Prohmrangsri from Luang Phu Nak. Luang Por Supoj gathered and saved up a large repository of the most powerful powders, and as many Pra Somdej Wat Rakang Kositaram pieces as he could before he made his Muan Sarn Sacred Powders for the amulets he had planned, and other amulets which devotees had brought to him when they broke, and ground them down into the extremely rich and sacred Muan Sarn. It is the powerful Muan Sarn clay, and the great Indojin (Indo-China Wartime) BBlessing Ceremony that has made his amulets so Important and Sacred from a religious, national, and Historic point of view. The presence of pure Pra Somdej Wat Rakang Kositaram Somdej Pra Puttajarn (Dto) Prohmrangsri in the clay of the amulets is what has made his amulets so highly regarded and famous historical artifacts in the present day, as well as the fact that all amulets blessed in the Piti Indojin Indo-China War Ceremony are considered to be powerful Master-Class amulets. The Piti Indojin Ceremony was considered to be the second biggest and most important amuletBlessing Ceremony in the History of Thai Buddhism. The Pra Somdej Chedi Norn Wat Lakprn Tam amulet, is a Classic Amulet, of Historic Fame, and an Eminent member of the Dtamra Pra Somdej, and in our opinion stands its ground with many amulets which carry extremely high prices compared to this amulet. Its Sacredness and Miraculous Power should be undoubted, for the fact that it was included in the Great 'Piti Indojin' Blessing Ceremony during the Indo-China Wartime. The Indojin Ceremony was considered to be the one of the 3 Biggest Ever Mass Blessing Ceremonies in all Thai History, along with the Wat racha Bopit and the 25 Putta Satawat Ceremony (2500 Years of Buddhism Celebration). The rear face has clearly visible elements of pieces of Pra Somdej Wat rakang within the Muan Sarn Clay. The highlight of the Pra Somdej Chedi Non of Luang Por Supoj, is the fact that it is made mostly from a Muan Sarn created from broken up Pra Somdej Wat Rakang Kositaram, from Somdej Pra Puttajarn (Dto) Prohmrangsri, the most powerful and important maker of Pra Somdej amulets of all time, whose amulets are both Miraculous, Impossible to afford, and of the Rarest of all amulets to find anywhere. The Pra Somdej Chedi Norn of Luang Por Supoj is made within the Dtamra of Pra Somdej which includes only a small number of Pra Somdej makers/temples in official status. and Belongs to the Pra Niyom Preferred Category of Sacred Pra Somdej Amulets within the Legend of Pra Somdej. The front face of the amulet features the Buddha seated on a double Lotus Dais (Thaan Bua Glab - 'Bua' meaning 'lotus' and 'Glab' meaning 'reversed'). The Buddha is sat in the 'Khad Samati' meditation posture. The Buddha is framed within a decorative arched curtain, on a raised dais,with the sleeping Chedi below it. The right arm of the Buddha (to our left) is slimmer than the other arm. The rays of the Chedi Stupa have ione ray rising all the way up to the shoulder of the Buddha on one side. The right edge of the inner frame is closer to the edge of the amulet than the left frame border. The edge of the Pra Somdej reveals the age of the Muan Sarn, with a hardened and densified consistence, that is very dry, but looks almost wet with shine to it (Nuea Graeng). This is due to contraction of the porosity of the Sacred Powder. 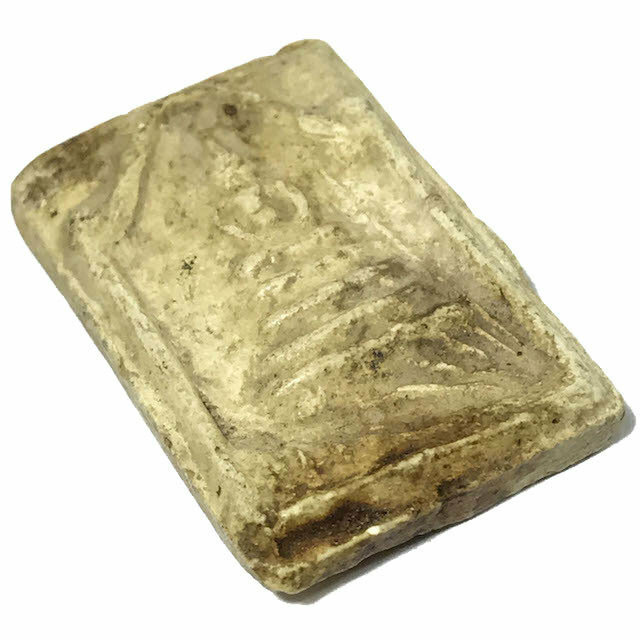 The pure content of Pra Somdej Wat Rakang Kositaram amulets used to make the ground Muan Sarn clay sacred Powder of the Somdej Putto, is so incredibly similar to that found in the original Pra Somdej Wat Rakang Kositaram of Somdej Pra Puttajarn (Dto) Prohmrangsri. So similar is it, that the amulet is considered to be one of the classic 'Ongk Kroo' ('Teacher Models' Reference Comparison Amulets) for the study and recognition of the Legendary Pra Somdej of Somdej Dto. Most of the world's top experts began their trajectory preparing to seek and find the Pra Somdej Wat Rakang Kositaram, by using this and other Pra Somdej of the 10 great temples of the Dtamra Pra Somdej, to study the Muan Sarn and characteristics. This is the method used to teach yourself to recognise a tru Pra Somdej Wat Rakang Kositaram, without having to spend millionaire type prices for a Pra Somdej Wat Rakang Kositaram of the Great Somdej Pra Puttajarn (Dto) Prohmrangsri. The amulet is made using instructions the Dtamra of the Great Pra Kroo Lamoon and the Wicha of Wat Sutat. 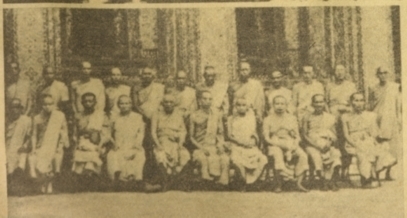 Luang Por Supoj was a close colleague of Luang Phu Nak (Wat Rakang Kositaram) and of Luang Phu Hin (Wat Rakang Kositaram). Because of his close friendship with these two Great Masters of Wat Rakang Kositaram, Luang Por Supoj recieved a large number of broken Pra Somdej Wat Rakang of Somdej Pra Puttajarn (Dto) Prohmrangsri. A close look here from the rear view, reveals the appearance of the Muan Sarn of Pra Somdej Wat Rakang, and Bang Khun Prohm amulets. The Muan Sarn content reveals various substances which were added by Somdej Pra Puttajarn (Dto) Prohmrangsri into his Pra Somdej, which include the five Pong Wised powders, black Bailan Parchment Powder Soot, Banana Seeds, Kampaeng Paetch amulets, and Pratat Relics. Luang Por Supoj was known for his silent manner, and his great ability to perform the Wicha Lob Pong, which is the Magical Occult Art of making sacred powders by inscribing Sacred Yant Inscriptions with Sacred Chalk on a special wooden board, in an immensely extensive formula which completes the full compendium of 108 Sacred Yantra spells. The powder residues from the Sacred Chalk was then collected, and used to make a new chalk stick. The chalk stick was then used to inscribe another 108 sacred Yant, until the process was performed 5 times in a row. This is of course the method used for making the famous 'Pong Wised 5 Chanid' (5 Sacred Powders) so famously used by Somdej Pra Puttajarn (Dto) Prohmrangsri of Wat Rakang Kositaram to make the legendary Pra Somdej Wat Rakang Kositaram. Other ingredients used to make the Pra Somdej Chedi Norn Wat Lakorn Tam support the study and appreciation of the Dtamra Pra Somdej Wat Rakang Kositaram, with the inclusion of broken amulets from the other Great Members of the Dtamra, including broken pieces of Pra Somdej of the Great Somdej Pra Sangkarach (Pae), and Luang Por Jao Khun Sri (Sonti, and Jao Khun Tip Gosa, who were foregoing Masters of of Wat Sutat, and Colleagues of the great Somdej Pra Puttajarn (Dto) Prohmrangsri. Pong Tabai metal filings from the casting of the World Famous Pra Kring Buddha statuette of Wat Sutat were also added to the sacred Muan Sarn of the Pra Somdej Putto, making it an incomparably Sacred Set of Magical and Faith Instilling Sacred Ingredients, and an Extremely Powerful Votive Tablet in its own right. If there is one thing that shold be noted, it is the fact that this amulet possesses its own inimitable Sacred Power and Importance, and the fact that it contains an extremely high quantity of Pra Somdej Wat Rakang Kositaram within its Muan Sarn, should not detract from its own Individual Status as an All Time Classic Pra Niyom Amulet of the Highest Importance and Sacredness. Luang Por Supoj was cnsidered one of the Great Masters of High Ability to 'Pluk Sek Wadthumongkol' (Bless and Empower amulets), and for this reason was one of the Masters who were always invited and asked to assit in empowerment of some of the most important Blessing Ceremonies in History, including the25 Centuries of Buddhism Ceremony (3rd Biggest in History), the 2506 Wat prasat Ceremony (4th Biggest and Important Ceremony in History), the Piti Pluk Sek Chonburi 2509 Ceremony (Wat Pha Chonburi).